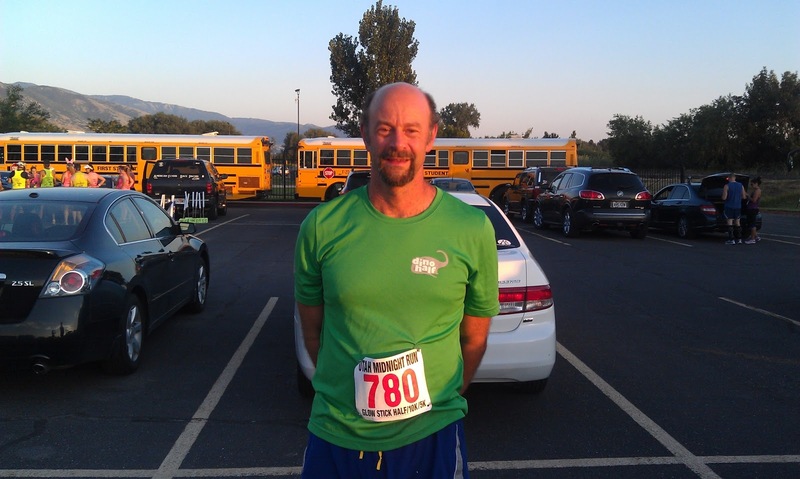 Last year, I ran a half marathon up in Farmington, Utah. 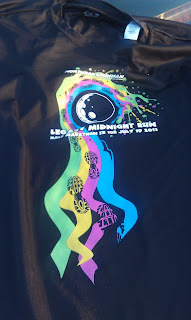 It was called the Legacy Midnight Half Marathon. It starts somewhere in north Salt Lake City in an industrial, sort of yucky area of the bike trail and heads north to Farmington. While the race starts at 10pm, it is called a Midnight run. 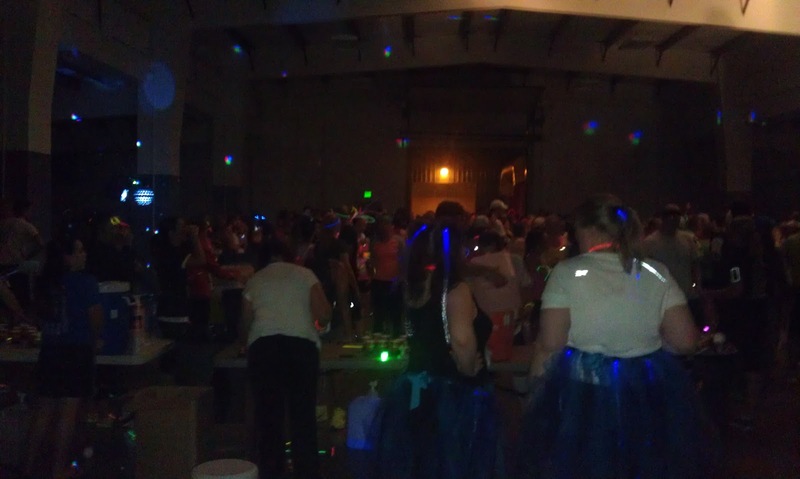 Basically, you are running on the bike trail with nothing but glow sticks (that you carry) for light. I've run their races before and I had a head lamp from the 2011 Las Vegas Marathon so for night races I always bring it. I don't necessarily wear it 100% of the time, but it is there when I need it. 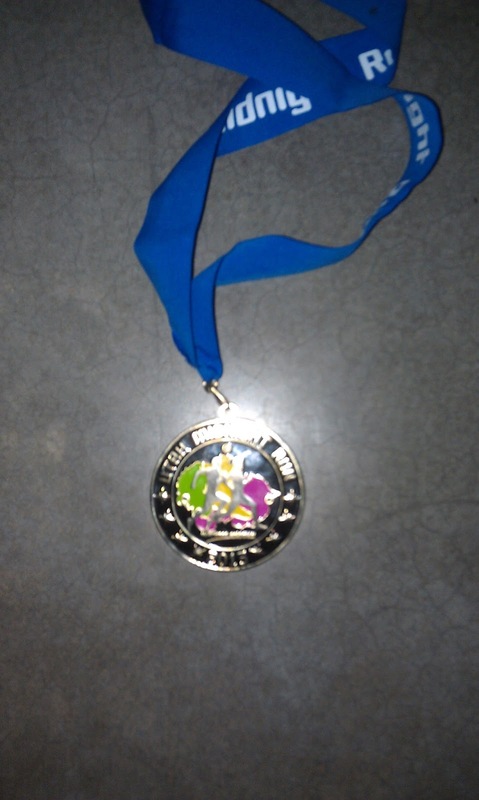 Last year, I ran the race in 1:39. It was probably the best race I had in terms of performance all year despite having to stop twice to because I came to junctions on the bike trail. They really didn't have it well marked last year and I wrote a letter to them. This year, the course markings were much better! I arrived at 8pm, got my swag and around 8:45 jumped on a school bus that drove us to North Salt Lake. It dropped us off a little after 9 and at that point you have to sit around in what looks like a rock quarry for about an hour. I brought mosquito repellent because last year I was eaten alive -- this year -- not so much. I felt pretty good even though my running hasn't been particularly going well. Whether it is a lack of training, too many marathons, over training, or father time taking another hit at me. I had eaten a nice stack of pancakes before commencing the race and I figured by the 10pm start time that they would've passed through -- no such luck. They sort of just hung in my gut... While I wasn't stuffed, I didn't feel light. 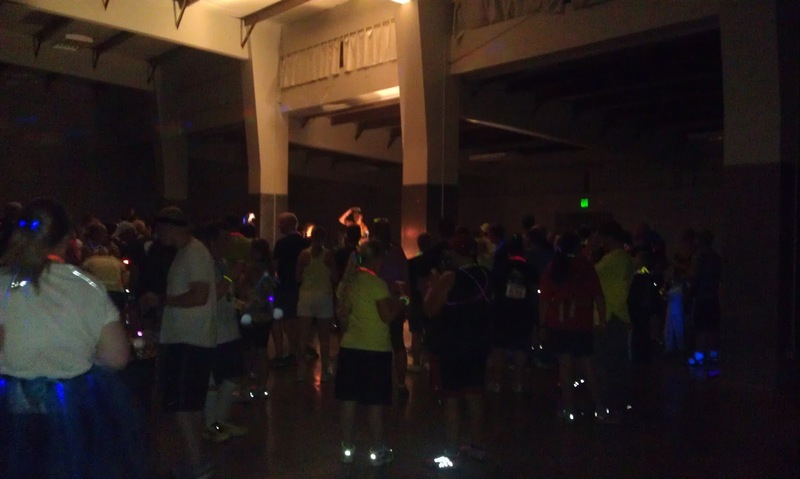 The race started promptly at 10pm and it was dark. There were a good 300+ runners there and it was exciting to see everyone decked out in costume and blinking lights. I locked into an 8 minute per mile pace and managed to hang onto that for about 6 miles. There weren't any mile markers on the course and my Garmin wasn't beeping every mile, so I was checking in to see how far into the race I was. I was mostly running solo but did hang with a girl for a mile or two. I want to say I reached the 10K mark at about 50 minutes -- right on target. However, once I crossed the 10K mark, my performance started to tank. I haven't studied my Garmin to see how bad I was off but it was getting warm and the stomach full of pancakes started to make me wonder if I was going to hurl. The last 5 miles or so felt like a crawl, but it was sort of rewarding to pass the 10K / 5K runners who were marking the return trip. I did discover that the air temperature was in the mid 70's -- while the sun wasn't baking me, it was certainly warm. I didn't have any problems on the trail -- as I knew the course and the beautiful bike trail was really charming to run down. It hugs the Legacy Freeway (215) so sometimes the approaching cars were blinding. 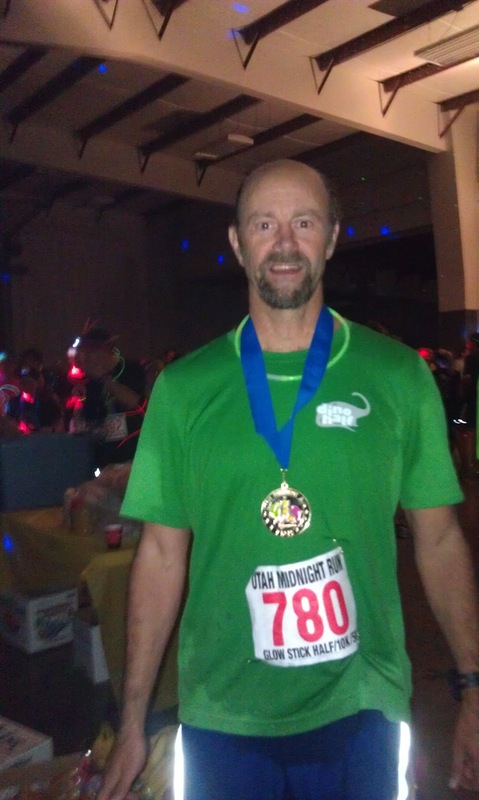 I crossed the finish line in 1:49. I wasn't happy with my time. There really wasn't any water at the end and I had to go into a building, make my way through a crowd to get some powerade -- which I chugged down (it was good and cold). It took a long time for my stomach to settle (for a while I was afraid I was going to pass out). I was 22nd place overall in the males, and 4th in my age division -- so sadly no extra hardware. I missed that by about 90 seconds. I was really disappointed in my run -- while I had a fantastic time and the course was accurate, I was really hoping to go sub 1:45. Me, feeling good before the race. Me post race - my stomach finally settled.